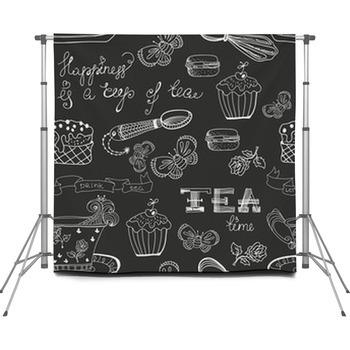 Give your clients portraits that embrace both the whimsicality of childhood and the elegance of maturity by offering them our tea party backdrops. 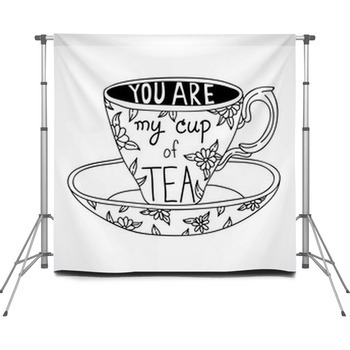 These portable backdrops use arrays of bright and rich colors to portray the daintiness, joy, serenity and sense of sharing that tea parties provide. Others convey a more refined mood, with subtler depictions of antique tea kettles. 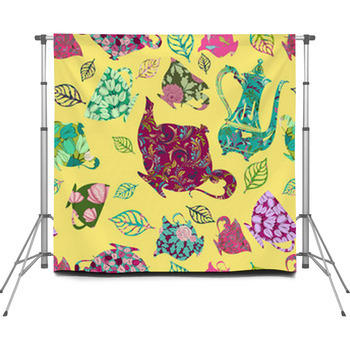 Begin your tea party backdrop set with a scene that brings to mind sitting at an outdoor table in spring, sipping on hot tea in the warm afternoon sun with friends and family. 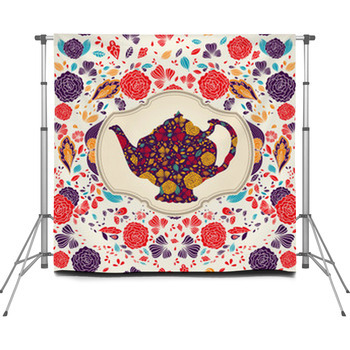 This photographer backdrop features a gorgeous teapot decorated with an intricate floral pattern of tiny golden, turquoise, red and violet flowers. The teapot is framed with a simple silver border, and set on a white background that is covered with larger flowers of those same colors. Other photo backdrops highlight the delicious treats that accompany tea parties. Cupcakes and hard candy are set beside mugs of tea and teaspoons in a design euphorically drawn with pink, light red, pale orange, mint green and soft purple. 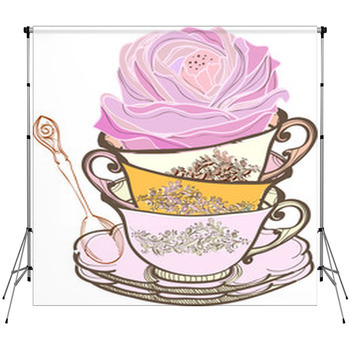 Then add a portable backdrop that exhibits a gourmet tea party in a photo image. Here four tall gold and purple glasses are set beside a shiny silver tea kettle filled with Moroccan mint tea. The backdrop also shows a luxurious platter of succulent Middle Eastern pastries. 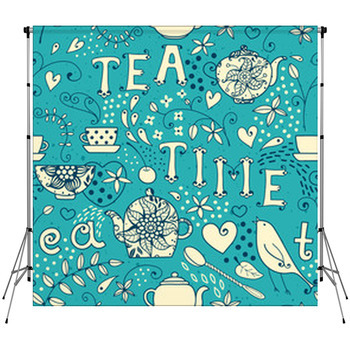 Convey the sense of contemplation and personal satisfaction that comes from a solitary cup of tea with a tea party backdrop. A plain white tea cup is set against a deep violet and black background. 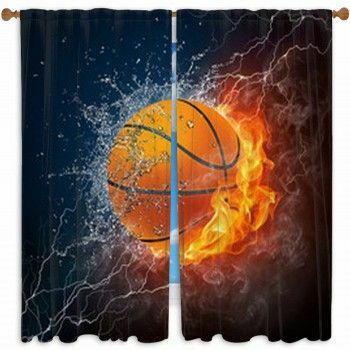 Smiling loops, swirls of ribbon and pieces of confetti, all colored teal, pink, light yellow, soft violet, tangerine orange and aqua, are flying out of the cup and across the custom backdrop.